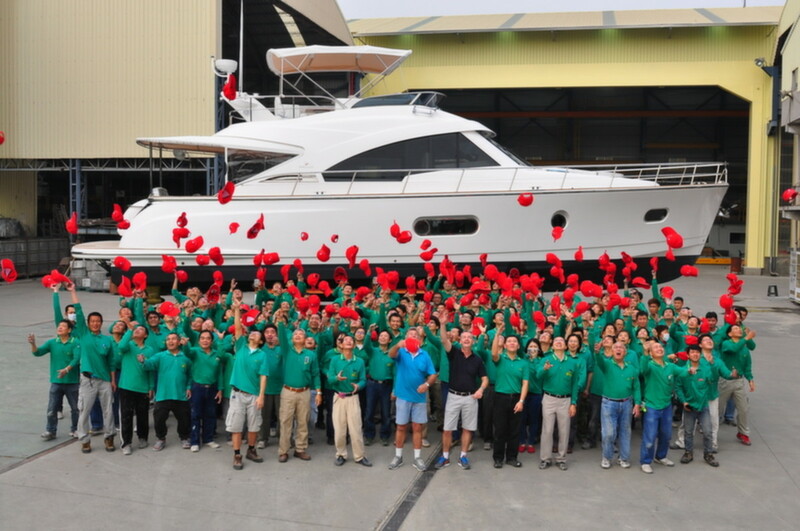 Riviera Yachts, which recently added 30 employees, celebrates the launch of the daybridge model of the Belize 54. MIAMI — Riviera Yachts introduced two new vessels at the Yacht & Brokerage Show in Miami Beach and CEO Wes Moxey said the Australian company added 30 employees as business has strengthened. "We continue to invest, to grow and we are very much invested in our people, our staff," Moxey said during a press event held to announce the new yachts. "In the forward order position, compared to last year, we have doubled the number of orders. When I talk forward orders I am not talking about dealer orders, I am talking about paid orders, boats that have been sold. That number has doubled; it is not as high as I would like it to be, but it is much stronger." Moxey told me after the event that the $2 million to $5 million market has strengthened significantly. "There is a lot of activity in this area, and people in this market are ready to invest in buying a boat," he said. The company introduced the daybridge model of its Belize 54 on the heels of the Belize 54 Sedan that debuted in the United States at the 2013 Fort Lauderdale International Boat Show. "The boat is a mix of the modern and the traditional," Moxey said. The Riviera 565 SUV also made its debut. Standard power is twin 700-hp Volvo Penta IPS900s.